Relieve stress after a long day with skin-soothing Bath Soak formulated to provide nourishing stress relief through a blend of essential oils and sea salts. Breathe deeply for best results. Add 3 or 4 capfuls to running water. Breathe in to feel your stress melt away. 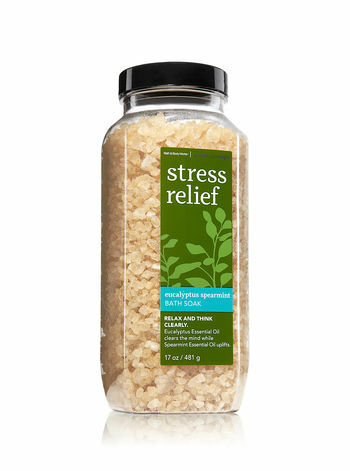 EUCALYPTUS SPEARMINT (Promotes Stress-Relief) - Eucalyptus Essential Oil clears the mind while Spearmint Essential Oil uplifts.